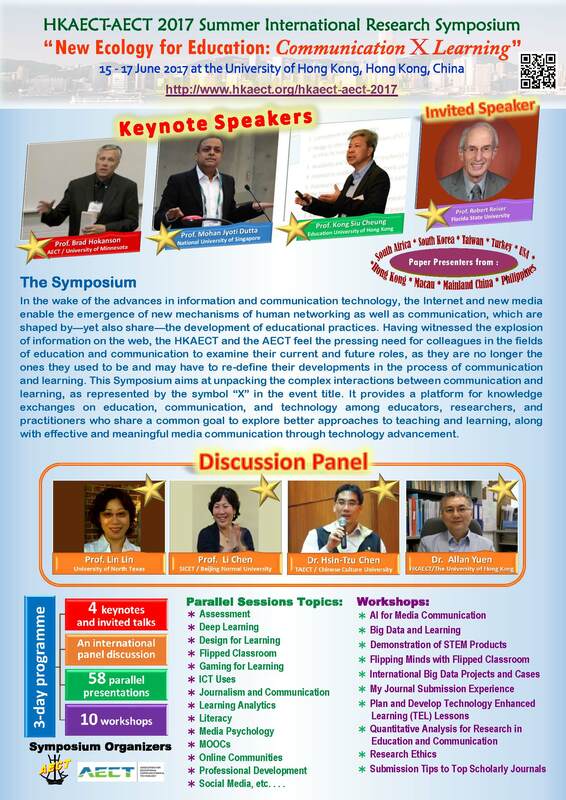 HKAECT Annual Meeting: "Educational Communications and Technology: Research and Publication"
HKAECT Annual Meeting: "Social Media in Education and Communication"
HKAECT Annual Meeting: "New Media and Education"
HKAECT Conference 2010: "Multiliteracies for the 21st Century: Education, Communication and Technology"
Co-organized by Centre for Information Technology in Education (CITE), The University of Hong Kong; Centre for the Advancement of Information Technology in Education (CAITE), The Chinese University of Hong Kong; Centre for Learning, Teaching and Technology, The Hong Kong Institute of Education; and HKU School of Professional and Continuing Education (SPACE). 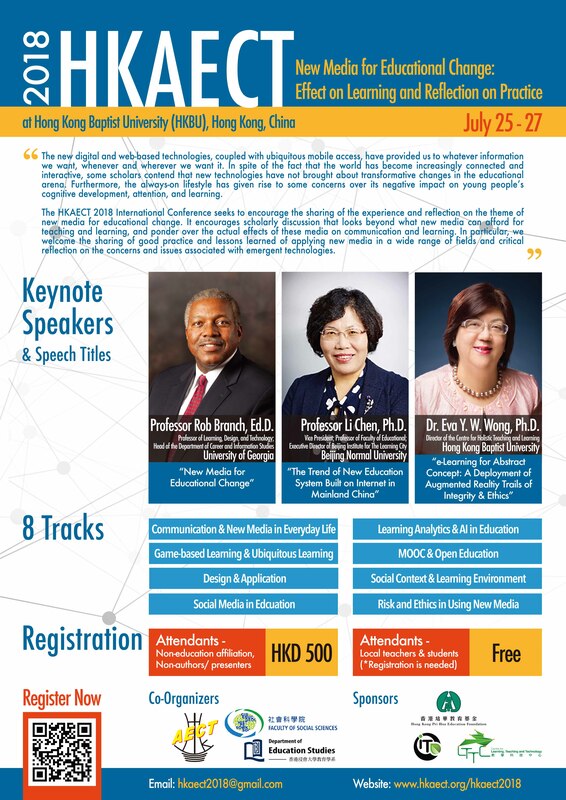 Co-organized by Centre for Education Development, Hong Kong Baptist University & The Division of Continuing Professional Education, The Hong Kong Institute of Education. 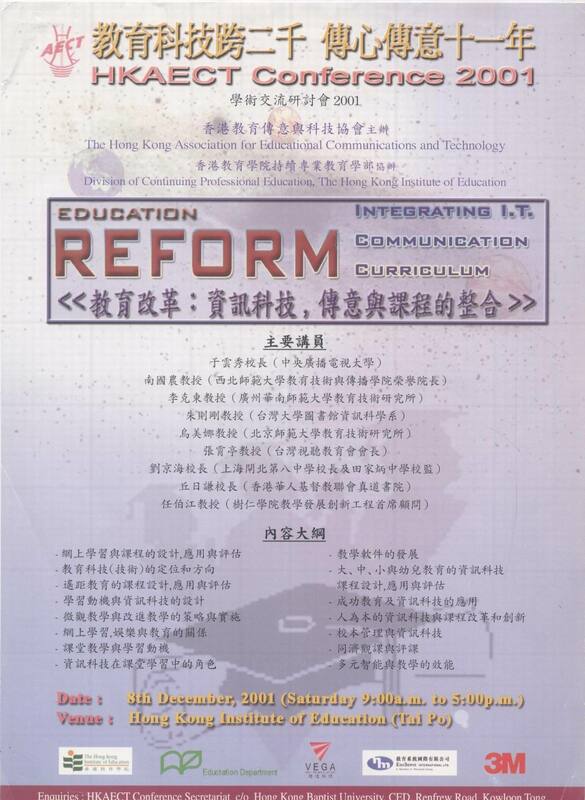 Conference: “Education Reform”, held at Hong Kong Institute of Education. 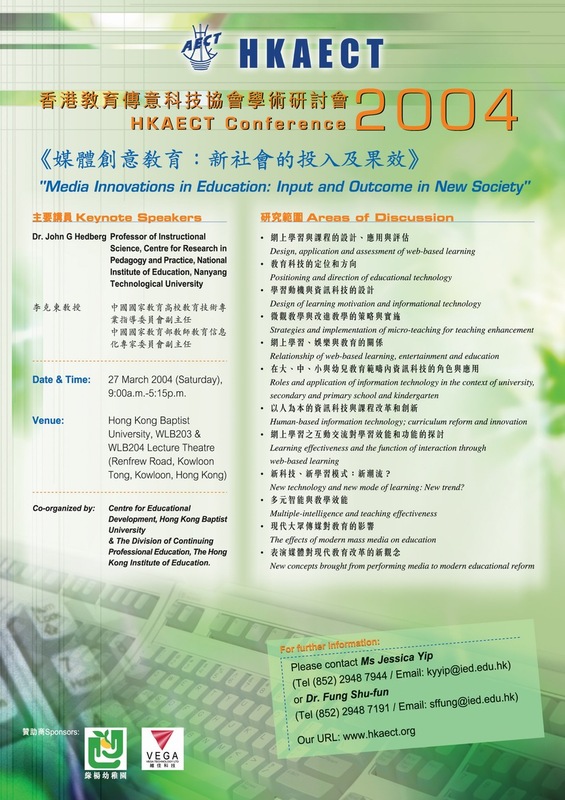 Co-organized by the Chinese Association of Educational Technology, the Shenzhen Audio-Visual Bureau and HKAECT. “New Challenges and Innovations in Teaching and Training into the 21st Century”. 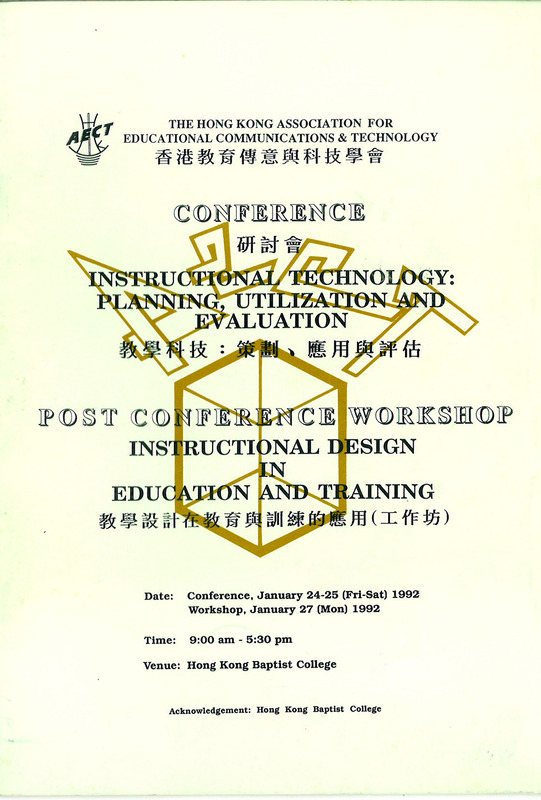 Sponsored by the Consortium for the Promotion of Teaching Skills and Technology Project, Lingnan College (then university}. 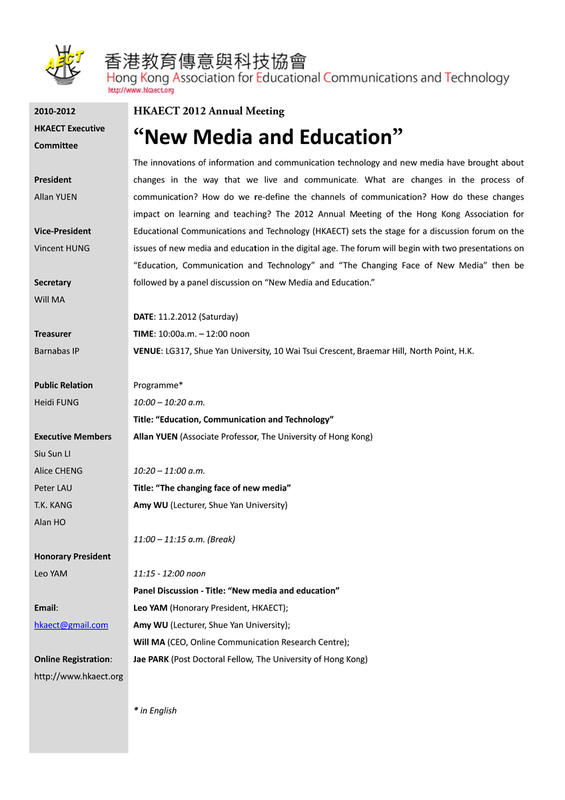 Seminar and workshop: “Teaching Communication”, for Hong Kong Private School Association. 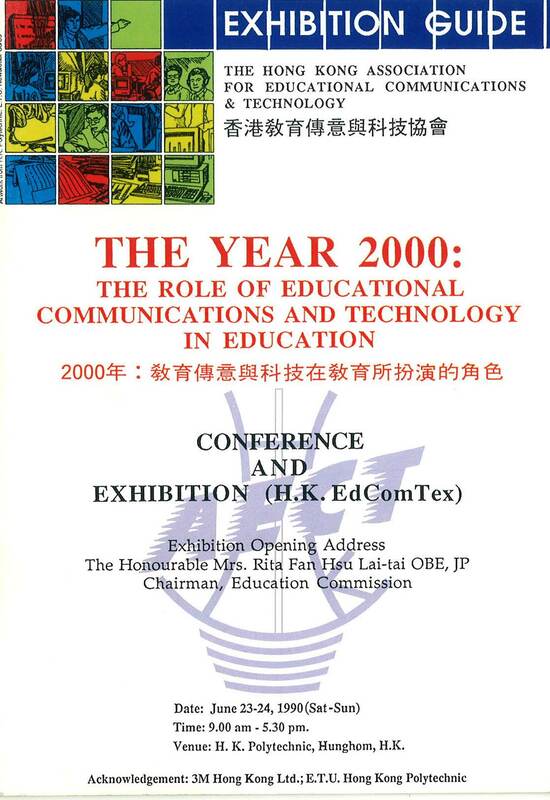 “Telecommunications in Education” was solely sponsored by Hong Kong Telecom Foundation. More than 10 major speakers coming from mainland, Singapore, Thailand, Malaysia, US, Macau and Hong Kong. To explore innovative ways and means in using telecommunications in the promotion of cross-cultural and educational programs among participating regions and countries. 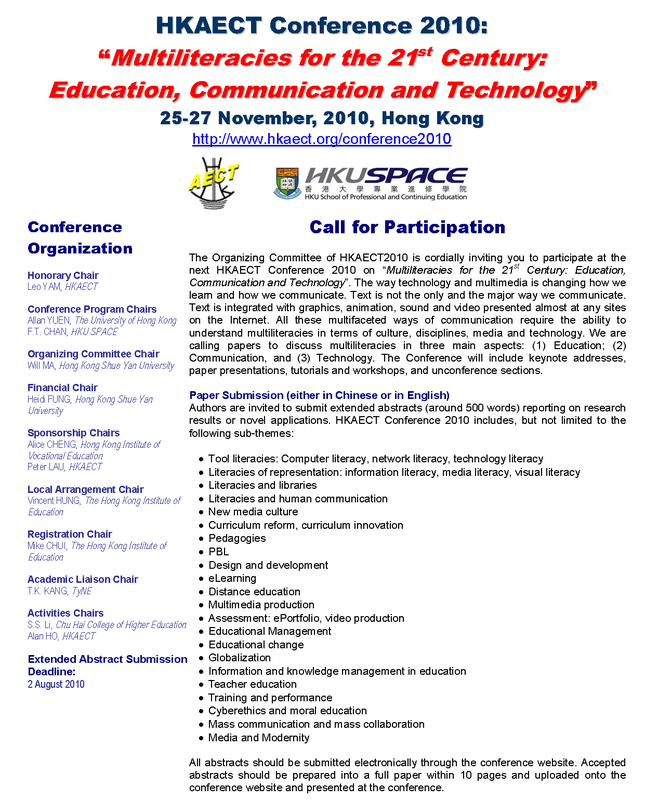 Seminar and workshop: “Educational Technology and Teaching Communication”, held in Hong Kong and Shenzhen. For educational technologists and administrators of the people’s Bank of China and the Chinese Finance and Commerce System of China. Prof. Jerold Kemp being our keynote speaker. Keynote speakers including Dr. Jenny Johnson from the Maryland University, Washing, D.C.U.S.A. By Mr. Philip from New Berry College, South Carolina, U.S.A.
“The Role of Television in Education and Society” and “Educational Television Product Production and Evaluation Workshop”, Chinese University of Hong Kong, Hong Kong Baptist College (then university}. Guest of Honor was Ms. Rita Fan, the chairperson of the HKSAR Legislative Council (1990) and Keynote Speakers came from USA, China and Taiwan. About 300 tertiary educators and professionals coming from mainland China, Taiwan, US, Macau, Singapore and Malaysia attended the Conference. It was the very first conference of its kind held in Hong Kong bringing scholars from both the mainland and Taiwan together. 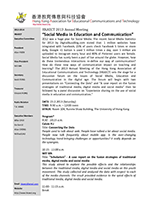 We used "three spoken media and two languages" to exchange views and thoughts in the development of communication and educational technology.